Date and Tamarind chutney is a sweet and sour chutney that plays a very important role in the chaat recipes. Along with the sweetness from the dates, some jaggery is also added to render additional sweetness. Dry ginger powder, roasted cumin powder, fennel powder,black salt and red chilli powder add layers of flavor to this sweet and tangy chutney. Take all the ingredients in a deep bottomed pan . Bring it to a boil and then simmer for 30-40 minutes until the dates and the tamarind are nice and soft. Once done, grind the mixture in a blender. Strain the ground mixture using a strainer. This chutney stores well in the refrigerator. (Note: I pour the chutney into small freezer safe containers and freeze them for later use). The prepared chutney is very thick. When its time for use, you can add some water to adjust the consistency. Use as needed in Chaat recipes like Bhel Puri, Sev Puri etc. Looks so yummy my dear. I loved the way you captured it. Truly a versatile and popular accompaniment. Ohhhhh!!!! 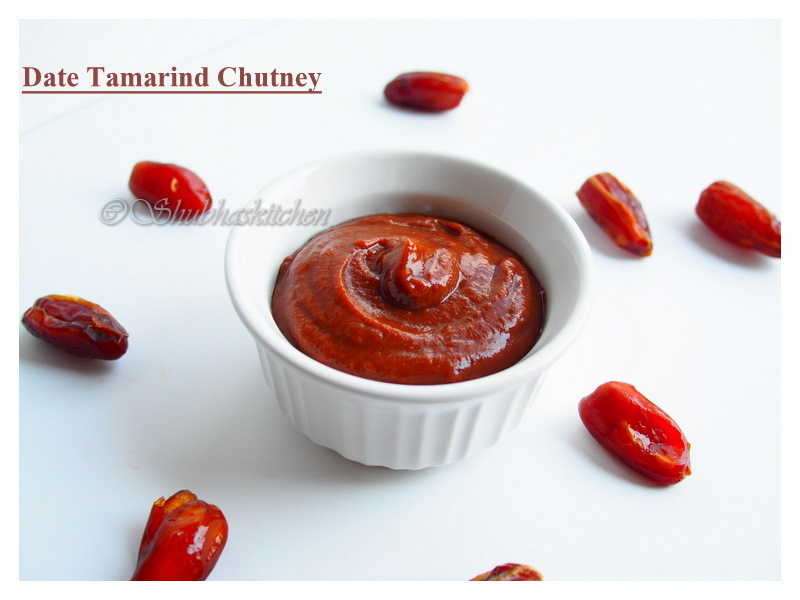 Lost for words but just feel like licking this chutney away. OH. MY. GOD. 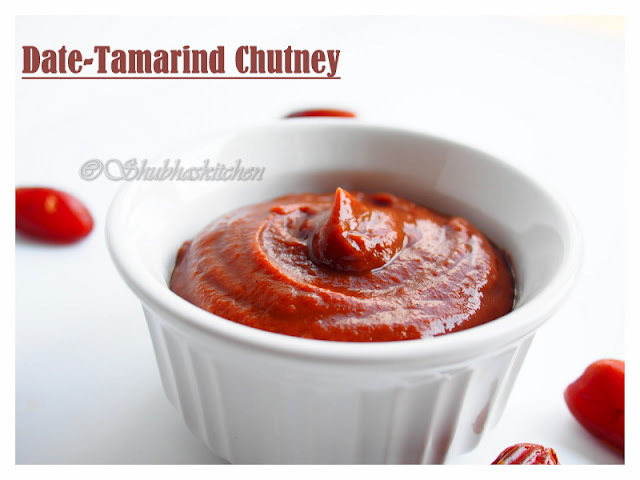 That red color of chutney is just gorgeous, Shubha. I can imagine the awesome flavors and sweet-tang taste. YUMMY! 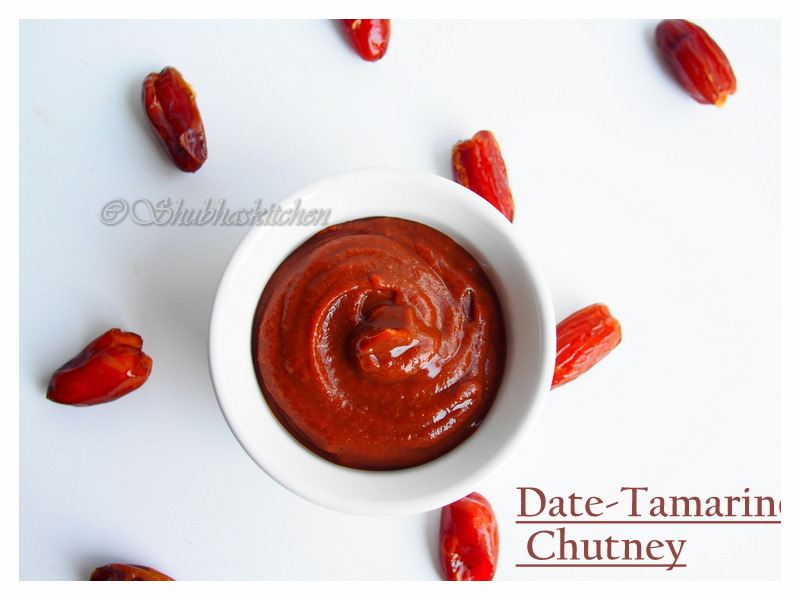 Chutney looks yummy...love the bright red colour Shubha! !